With a 70-year history of integrated experience in manufacturing coated abrasives, Fandeli International exports its products to more than 20 countries in four continents including the US and Canada. Fandeli ‘s principle manufacturing facilities are located in Mexico where the company has invested heavily in state-of-the-art equipment and quality control systems. North American sales are managed from Fandeli’s offices in Houston Texas. 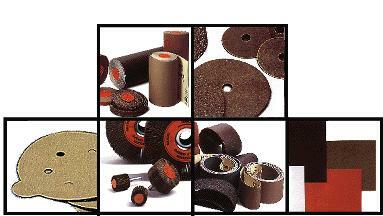 Typical coated abrasives we manufacture include sheets, discs, rolls, belts, and specialties for the wood, plastic, metal, leather, glass, paint , and nonferrous industries. This page is a weblink to another server containing Fandeli International webpages. To return to the Abrasives Mall use your browser's back key or the alt-left arrow keys.